Evolution by natural selection describes a mechanism for how species change over time. Scientists, philosophers, researchers, and others had made suggestions and debated this topic well before Darwin began to explore this idea. Classical Greek philosopher Plato emphasized in his writings that species were static and unchanging, yet there were also ancient Greeks who expressed evolutionary ideas. In the eighteenth century, naturalist Georges-Louis Leclerc Comte de Buffon reintroduced ideas about the evolution of animals and observed that various geographic regions have different plant and animal populations, even when the environments are similar. Some at this time also accepted that there were extinct species. Also during the eighteenth century, James Hutton, a Scottish geologist and naturalist, proposed that geological change occurred gradually by accumulating small changes from processes operating like they are today over long periods of time. This contrasted with the predominant view that the planet’s geology was a consequence of catastrophic events occurring during a relatively brief past. Nineteenth century geologist Charles Lyell popularized Hutton’s view. A friend to Darwin. Lyell’s ideas were influential on Darwin’s thinking: Lyell’s notion of the greater age of Earth gave more time for gradual change in species, and the process of change provided an analogy for this change. In the early nineteenth century, Jean-Baptiste Lamarck published a book that detailed a mechanism for evolutionary change. We now refer to this mechanism as an inheritance of acquired characteristics by which the environment causes modifications in an individual, or offspring could use or disuse of a structure during its lifetime, and thus bring about change in a species. While many discredited this mechanism for evolutionary change, Lamarck’s ideas were an important influence on evolutionary thought. In the mid-nineteenth century, two naturalists, Charles Darwin and Alfred Russel Wallace, independently conceived and described the actual mechanism for evolution. Importantly, each naturalist spent time exploring the natural world on expeditions to the tropics. From 1831 to 1836, Darwin traveled around the world on H.M.S. Beagle, including stops in South America, Australia, and the southern tip of Africa. Wallace traveled to Brazil to collect insects in the Amazon rainforest from 1848 to 1852 and to the Malay Archipelago from 1854 to 1862. Darwin’s journey, like Wallace’s later journeys to the Malay Archipelago, included stops at several island chains, the last being the Galápagos Islands west of Ecuador. On these islands, Darwin observed species of organisms on different islands that were clearly similar, yet had distinct differences. For example, the ground finches inhabiting the Galápagos Islands comprised several species with a unique beak shape ((Figure)). The species on the islands had a graded series of beak sizes and shapes with very small differences between the most similar. He observed that these finches closely resembled another finch species on the South American mainland. Darwin imagined that the island species might be species modified from one of the original mainland species. Upon further study, he realized that each finch’s varied beaks helped the birds acquire a specific type of food. For example, seed-eating finches had stronger, thicker beaks for breaking seeds, and insect-eating finches had spear-like beaks for stabbing their prey. 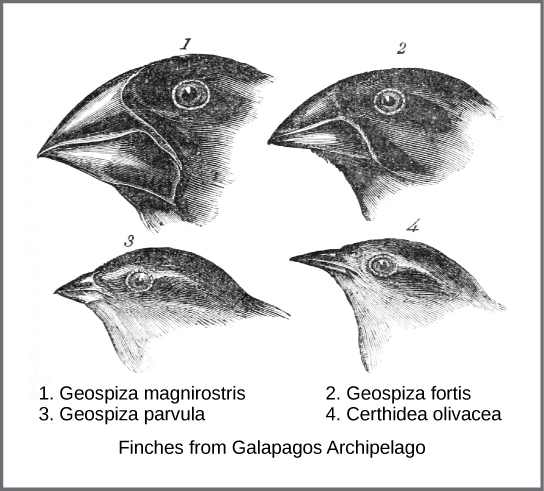 Darwin observed that beak shape varies among finch species. He postulated that ancestral species’ beaks had adapted over time to equip the finches to acquire different food sources. Wallace and Darwin both observed similar patterns in other organisms and they independently developed the same explanation for how and why such changes could take place. Darwin called this mechanism natural selection. Natural selection, or “survival of the fittest,” is the more prolific reproduction of individuals with favorable traits that survive environmental change because of those traits. This leads to evolutionary change. For example, Darwin observed a population of giant tortoises in the Galápagos Archipelago to have longer necks than those that lived on other islands with dry lowlands. These tortoises were “selected” because they could reach more leaves and access more food than those with short necks. In times of drought when fewer leaves would be available, those that could reach more leaves had a better chance to eat and survive than those that couldn’t reach the food source. Consequently, long-necked tortoises would be more likely to be reproductively successful and pass the long-necked trait to their offspring. Over time, only long-necked tortoises would be present in the population. Natural selection, Darwin argued, was an inevitable outcome of three principles that operated in nature. First, most characteristics of organisms are inherited, or passed from parent to offspring. Although no one, including Darwin and Wallace, knew how this happened at the time, it was a common understanding. Second, more offspring are produced than are able to survive, so resources for survival and reproduction are limited. The capacity for reproduction in all organisms outstrips the availability of resources to support their numbers. Thus, there is competition for those resources in each generation. Both Darwin and Wallace’s understanding of this principle came from reading economist Thomas Malthus’ essay that explained this principle in relation to human populations. Third, offspring vary among each other in regard to their characteristics and those variations are inherited. Darwin and Wallace reasoned that offspring with inherited characteristics which allow them to best compete for limited resources will survive and have more offspring than those individuals with variations that are less able to compete. Because characteristics are inherited, these traits will be better represented in the next generation. This will lead to change in populations over generations in a process that Darwin called descent with modification. Ultimately, natural selection leads to greater adaptation of the population to its local environment. It is the only mechanism known for adaptive evolution. In 1858, Darwin and Wallace ((Figure)) presented papers at the Linnean Society in London that discussed the idea of natural selection. The following year Darwin’s book, On the Origin of Species, was published. His book outlined in considerable detail his arguments for evolution by natural selection. 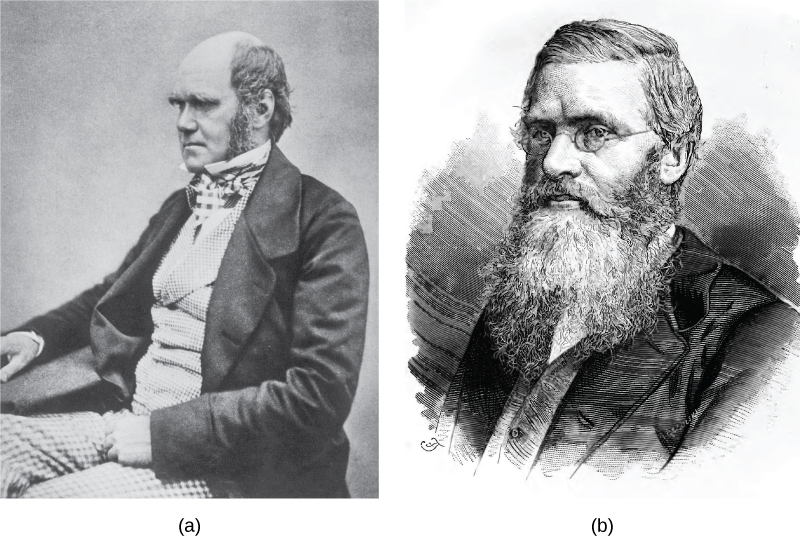 Both (a) Charles Darwin and (b) Alfred Wallace wrote scientific papers on natural selection that they presented together at the Linnean Society in 1858. It is difficult and time-consuming to document and present examples of evolution by natural selection. The Galápagos finches are an excellent example. Peter and Rosemary Grant and their colleagues have studied Galápagos finch populations every year since 1976 and have provided important evidence of natural selection. The Grants found changes from one generation to the next in beak shape distribution with the medium ground finch on the Galápagos island of Daphne Major. The birds have inherited a variation in their bill shape with some having wide deep bills and others having thinner bills. During a period in which rainfall was higher than normal because of an El Niño, there was a lack of large hard seeds of which the large-billed birds ate; however, there was an abundance of the small soft seeds which the small-billed birds ate. Therefore, the small-billed birds were able to survive and reproduce. In the years following this El Niño, the Grants measured beak sizes in the population and found that the average bill size was smaller. Since bill size is an inherited trait, parents with smaller bills had more offspring and the bill evolved into a much smaller size. As conditions improved in 1987 and larger seeds became more available, the trend toward smaller average bill size ceased. Field BiologistMany people hike, explore caves, scuba dive, or climb mountains for recreation. People often participate in these activities hoping to see wildlife. Experiencing the outdoors can be incredibly enjoyable and invigorating. What if your job entailed working in the wilderness? Field biologists by definition work outdoors in the “field.” The term field in this case refers to any location outdoors, even under water. 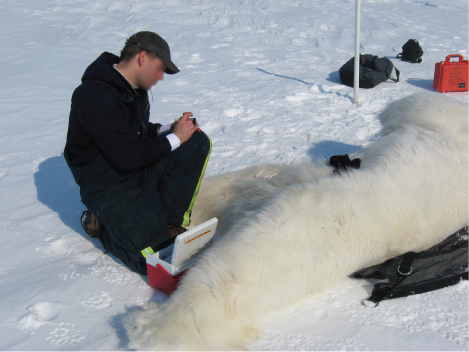 A field biologist typically focuses research on a certain species, group of organisms, or a single habitat ((Figure)). One objective of many field biologists includes discovering new, unrecorded species. Not only do such findings expand our understanding of the natural world, but they also lead to important innovations in fields such as medicine and agriculture. Plant and microbial species, in particular, can reveal new medicinal and nutritive knowledge. Other organisms can play key roles in ecosystems or if rare require protection. When discovered, researchers can use these important species as evidence for environmental regulations and laws. Natural selection can only take place if there is variation, or differences, among individuals in a population. Importantly, these differences must have some genetic basis; otherwise, the selection will not lead to change in the next generation. This is critical because nongenetic reasons can cause variation among individuals such as an individual’s height because of better nutrition rather than different genes. Genetic diversity in a population comes from two main mechanisms: mutation and sexual reproduction. Mutation, a change in DNA, is the ultimate source of new alleles, or new genetic variation in any population. The genetic changes that mutation causes can have one of three outcomes on the phenotype. A mutation affects the organism’s phenotype in a way that gives it reduced fitness—lower likelihood of survival or fewer offspring. A mutation may produce a phenotype with a beneficial effect on fitness. Many mutations will also have no effect on the phenotype’s fitness. We call these neutral mutations. Mutations may also have a whole range of effect sizes on the organism’s fitness that expresses them in their phenotype, from a small effect to a great effect. Sexual reproduction also leads to genetic diversity: when two parents reproduce, unique combinations of alleles assemble to produce the unique genotypes and thus phenotypes in each offspring. We call a heritable trait that helps an organism’s survival and reproduction in its present environment an adaptation. Scientists describe groups of organisms adapting to their environment when a genetic variation occurs over time that increases or maintains the population’s “fit” to its environment. A platypus’s webbed feet are an adaptation for swimming. A snow leopard’s thick fur is an adaptation for living in the cold. A cheetah’s fast speed is an adaptation for catching prey. Whether or not a trait is favorable depends on the current environmental conditions. The same traits are not always selected because environmental conditions can change. For example, consider a plant species that grew in a moist climate and did not need to conserve water. Large leaves were selected because they allowed the plant to obtain more energy from the sun. Large leaves require more water to maintain than small leaves, and the moist environment provided favorable conditions to support large leaves. After thousands of years, the climate changed, and the area no longer had excess water. The direction of natural selection shifted so that plants with small leaves were selected because those populations were able to conserve water to survive the new environmental conditions. The evolution of species has resulted in enormous variation in form and function. Sometimes, evolution gives rise to groups of organisms that become tremendously different from each other. We call two species that evolve in diverse directions from a common point divergent evolution. We can see such divergent evolution in the forms of the reproductive organs of flowering plants which share the same basic anatomies; however, they can look very different as a result of selection in different physical environments and adaptation to different kinds of pollinators ((Figure)). In other cases, similar phenotypes evolve independently in distantly related species. For example, flight has evolved in both bats and insects, and they both have structures we refer to as wings, which are adaptations to flight. However, bat and insect wings have evolved from very different original structures. We call this phenomenon convergent evolution, where similar traits evolve independently in species that do not share a common ancestry. The two species came to the same function, flying, but did so separately from each other. These physical changes occur over enormous time spans and help explain how evolution occurs. Natural selection acts on individual organisms, which can then shape an entire species. Although natural selection may work in a single generation on an individual, it can take thousands or even millions of years for an entire species’ genotype to evolve. It is over these large time spans that life on earth has changed and continues to change. The evidence for evolution is compelling and extensive. Looking at every level of organization in living systems, biologists see the signature of past and present evolution. Darwin dedicated a large portion of his book, On the Origin of Species, to identifying patterns in nature that were consistent with evolution, and since Darwin, our understanding has become clearer and broader. Fossils provide solid evidence that organisms from the past are not the same as those today, and fossils show a progression of evolution. Scientists determine the age of fossils and categorize them from all over the world to determine when the organisms lived relative to each other. The resulting fossil record tells the story of the past and shows the evolution of form over millions of years ((Figure)). For example, scientists have recovered highly detailed records showing the evolution of humans and horses ((Figure)). The whale flipper shares a similar morphology to bird and mammal appendages ((Figure)) indicating that these species share a common ancestor. In this (a) display, fossil hominids are arranged from oldest (bottom) to newest (top). As hominids evolved, the skull’s shape changed. An artist’s rendition of (b) extinct species of the genus Equus reveals that these ancient species resembled the modern horse (Equus ferus) but varied in size. Another type of evidence for evolution is the presence of structures in organisms that share the same basic form. 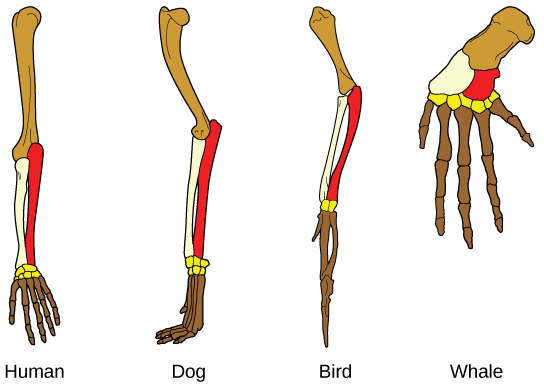 For example, the bones in human, dog, bird, and whale appendages all share the same overall construction ((Figure)) resulting from their origin in a common ancestor’s appendages. Over time, evolution led to changes in the bones’ shapes and sizes different species, but they have maintained the same overall layout. Scientists call these synonymous parts homologous structures. Some structures exist in organisms that have no apparent function at all, and appear to be residual parts from a past common ancestor. We call these unused structures without function vestigial structures. Other examples of vestigial structures are wings on flightless birds, leaves on some cacti, and hind leg bones in whales. Visit this interactive site to guess which bone structures are homologous and which are analogous, and see examples of evolutionary adaptations to illustrate these concepts. Another evidence of evolution is the convergence of form in organisms that share similar environments. 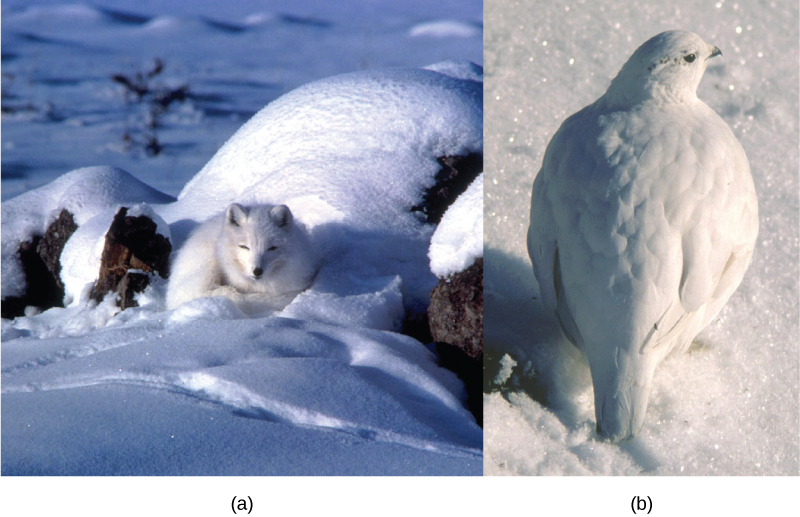 For example, species of unrelated animals, such as the arctic fox and ptarmigan, living in the arctic region have been selected for seasonal white phenotypes during winter to blend with the snow and ice ((Figure)). These similarities occur not because of common ancestry, but because of similar selection pressures—the benefits of predators not seeing them. Embryology, the study of the anatomy of an organism’s development to its adult form, also provides evidence of relatedness between now widely divergent groups of organisms. Mutational tweaking in the embryo can have such magnified consequences in the adult that tends to conserve embryo formation. As a result, structures that are absent in some groups often appear in their embryonic forms and disappear when they reach the adult or juvenile form. For example, all vertebrate embryos, including humans, exhibit gill slits and tails at some point in their early development. These disappear in the adults of terrestrial groups but adult forms of aquatic groups such as fish and some amphibians maintain them. Great ape embryos, including humans, have a tail structure during their development that they lose when they are born. The geographic distribution of organisms on the planet follows patterns that we can explain best by evolution in conjunction with tectonic plate movement over geological time. Broad groups that evolved before the supercontinent Pangaea broke up (about 200 million years ago) are distributed worldwide. Groups that evolved since the breakup appear uniquely in regions of the planet, such as the unique flora and fauna of northern continents that formed from the supercontinent Laurasia and of the southern continents that formed from the supercontinent Gondwana. The presence of members of the plant family Proteaceae in Australia, southern Africa, and South America was most predominant prior to the southern supercontinent Gondwana breaking up. Marsupial diversification in Australia and the absence of other mammals reflect Australia’s long isolation. Australia has an abundance of endemic species—species found nowhere else—which is typical of islands whose isolation by expanses of water prevents species to migrate. Over time, these species diverge evolutionarily into new species that look very different from their ancestors that may exist on the mainland. Australia’s marsupials, the Galápagos’ finches, and many species on the Hawaiian Islands are all unique to their one point of origin, yet they display distant relationships to ancestral species on mainlands. Like anatomical structures, the molecular structures of life reflect descent with modification. DNA’s universality reflects evidence of a common ancestor for all of life. Fundamental divisions in life between the genetic code, DNA replication, and expression are reflected in major structural differences in otherwise conservative structures such as ribosome components and membrane structures. In general, the relatedness of groups of organisms is reflected in the similarity of their DNA sequences—exactly the pattern that we would expect from descent and diversification from a common ancestor. DNA sequences have also shed light on some of the mechanisms of evolution. For example, it is clear that the evolution of new functions for proteins commonly occurs after gene duplication events that allow freely modifying one copy by mutation, selection, or drift (changes in a population’s gene pool resulting from chance), while the second copy continues to produce a functional protein. Although the theory of evolution generated some controversy when Darwin first proposed it, biologists almost universally accepted it, particularly younger biologists, within 20 years after publication of On the Origin of Species. Nevertheless, the theory of evolution is a difficult concept and misconceptions about how it works abound. This site addresses some of the main misconceptions associated with the theory of evolution. Critics of the theory of evolution dismiss its importance by purposefully confounding the everyday usage of the word “theory” with the way scientists use the word. In science, we understand a “theory” to be a body of thoroughly tested and verified explanations for a set of observations of the natural world. Scientists have a theory of the atom, a theory of gravity, and the theory of relativity, each which describes understood facts about the world. In the same way, the theory of evolution describes facts about the living world. As such, a theory in science has survived significant efforts to discredit it by scientists. In contrast, a “theory” in common vernacular is a word meaning a guess or suggested explanation. This meaning is more akin to the scientific concept of “hypothesis.” When critics of evolution say it is “just a theory,” they are implying that there is little evidence supporting it and that it is still in the process of rigorous testing. This is a mischaracterization. Evolution is the change in a population’s genetic composition over time, specifically over generations, resulting from differential reproduction of individuals with certain alleles. Individuals do change over their lifetime, obviously, but this is development and involves changes programmed by the set of genes the individual acquired at birth in coordination with the individual’s environment. When thinking about the evolution of a characteristic, it is probably best to think about the change of the average value of the characteristic in the population over time. For example, when natural selection leads to bill-size change in medium ground finches in the Galápagos, this does not mean that individual bills on the finches are changing. If one measures the average bill size among all individuals in the population at one time and then measures them in the population several years later, this average value will be different as a result of evolution. Although some individuals may survive from the first time to the second, they will still have the same bill size; however, there will be many new individuals who contribute to the shift in average bill size. It is a common misunderstanding that evolution includes an explanation of life’s origins. Conversely, some of the theory’s critics believe that it cannot explain the origin of life. The theory does not try to explain the origin of life. The theory of evolution explains how populations change over time and how life diversifies the origin of species. It does not shed light on the beginnings of life including the origins of the first cells, which define life. Importantly, biologists believe that the presence of life on Earth precludes the possibility that the events that led to life on Earth can repeat themselves because the intermediate stages would immediately become food for existing living things. However, once a mechanism of inheritance was in place in the form of a molecule like DNA either within a cell or pre-cell, these entities would be subject to the principle of natural selection. More effective reproducers would increase in frequency at the expense of inefficient reproducers. While evolution does not explain the origin of life, it may have something to say about some of the processes operating once pre-living entities acquired certain properties. Statements such as “organisms evolve in response to a change in an environment” are quite common, but such statements can lead to two types of misunderstandings. First, do not interpret the statement to mean that individual organisms evolve. The statement is shorthand for “a population evolves in response to a changing environment.” However, a second misunderstanding may arise by interpreting the statement to mean that the evolution is somehow intentional. A changed environment results in some individuals in the population, those with particular phenotypes, benefiting and therefore producing proportionately more offspring than other phenotypes. This results in change in the population if the characteristics are genetically determined. It is also important to understand that the variation that natural selection works on is already in a population and does not arise in response to an environmental change. For example, applying antibiotics to a population of bacteria will, over time, select a population of bacteria that are resistant to antibiotics. The resistance, which a gene causes, did not arise by mutation because of applying the antibiotic. The gene for resistance was already present in the bacteria’s gene pool, likely at a low frequency. The antibiotic, which kills the bacterial cells without the resistance gene, strongly selects individuals that are resistant, since these would be the only ones that survived and divided. Experiments have demonstrated that mutations for antibiotic resistance do not arise as a result of antibiotic. In a larger sense, evolution is not goal directed. Species do not become “better” over time. They simply track their changing environment with adaptations that maximize their reproduction in a particular environment at a particular time. Evolution has no goal of making faster, bigger, more complex, or even smarter species, despite the commonness of this kind of language in popular discourse. What characteristics evolve in a species are a function of the variation present and the environment, both of which are constantly changing in a nondirectional way. A trait that fits in one environment at one time may well be fatal at some point in the future. This holds equally well for insect and human species. Evolution is the process of adaptation through mutation which allows more desirable characteristics to pass to the next generation. Over time, organisms evolve more characteristics that are beneficial to their survival. For living organisms to adapt and change to environmental pressures, genetic variation must be present. With genetic variation, individuals have differences in form and function that allow some to survive certain conditions better than others. These organisms pass their favorable traits to their offspring. Eventually, environments change, and what was once a desirable, advantageous trait may become an undesirable trait and organisms may further evolve. Evolution may be convergent with similar traits evolving in multiple species or divergent with diverse traits evolving in multiple species that came from a common ancestor. We can observe evidence of evolution by means of DNA code and the fossil record, and also by the existence of homologous and vestigial structures. Which scientific concept did Charles Darwin and Alfred Wallace independently discover? The seeds of two plants land near each other and one grows larger than the other. Two types of fish eat the same kind of food, and one is better able to gather food than the other. Male lions compete for the right to mate with females, with only one possible winner. Which description is an example of a phenotype? A certain duck has a blue beak. A mutation occurred to a flower. Most cheetahs live solitary lives. Which situation is most likely an example of convergent evolution? Squid and humans have eyes similar in structure. Worms and snakes both move without legs. Some bats and birds have wings that allow them to fly. If a person scatters a handful of garden pea plant seeds in one area, how would natural selection work in this situation? The plants that can best use the resources of the area, including competing with other individuals for those resources will produce more seeds themselves and those traits that allowed them to better use the resources will increase in the population of the next generation. Why do scientists consider vestigial structures evidence for evolution? Vestigial structures are considered evidence for evolution because most structures do not exist in an organism without serving some function either presently or in the past. A vestigial structure indicates a past form or function that has since changed, but the structure remains present because it had a function in the ancestor. How does the scientific meaning of “theory” differ from the common vernacular meaning? In science, a theory is a thoroughly tested and verified set of explanations for a body of observations of nature. It is the strongest form of knowledge in science. In contrast, a theory in common vernacular can mean a guess or speculation about something, meaning that the knowledge implied by the theory is very weak. The statement implies that there is a goal to evolution and that the monkey represents greater progress to that goal than the mouse. Both species are likely to be well adapted to their particular environments, which is the outcome of natural selection. Understanding Evolution by OpenStax Biology 2nd Edition is licensed under a Creative Commons Attribution 4.0 International License, except where otherwise noted.